pushbuttons, circuit breakers, overload relays, EASY PLC's, safety switches, etc. We stock a complete inventory of Klockner Moeller Electric - relays, contactors, breakers, limit switches, pushbuttons, safety switches, etc., for immediate shipment. 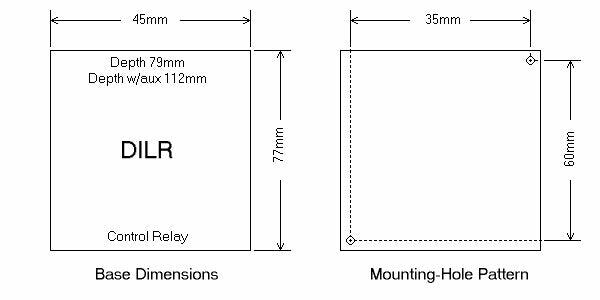 Click here for more information on DILA control relays, accessories and replacement charts. 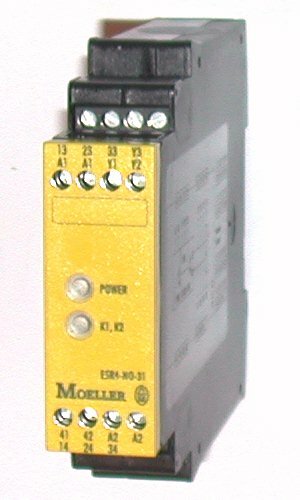 Klockner Moeller Electric offers a complete line of heavy-duty industrial control relays for every application. Shown here are both the 4-pole and the 8-pole versions. We stock all types in 24, 42, 120, 240 Volts, and several other coil voltages. Most any configuration imaginable is available and in stock at our New Jersey Warehouse. A miniature version is also available. Moeller offers the new line of motor contactors..
Click for more info on New: DILM7 - DILM12 contactors and accessories, photos. 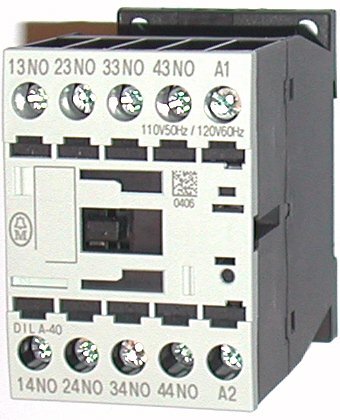 Click for more info on New: DILM17 - DILM32 contactors and accessories, photos. 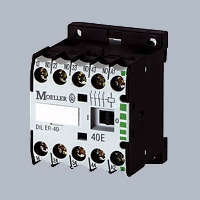 Click for more info on New: DILM40 - DILM150 contactors and accessories, photos. 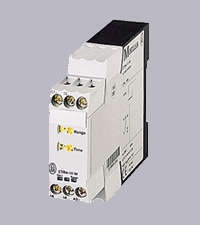 Click for more info on New: DILM185 - DILM1000 contactors and accessories. see our replacement charts for the older DIL series. 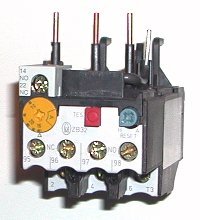 There is a contactor for all sizes from 1 to 500 Horsepower. All Contactors are rated 600 Volts AC. They are all designed to have a lifespan of over 1 million operations, and selection data is provided for applications where even longer lifespan is needed. There is a Moeller overload relay for every size up to 820 amps. Shown here is the Z00 series, in plug-in style and separate mounting style. These overloads are class 10, meaning they will trip out at 10 seconds or less on a locked rotor motor condition. Click here for information on ZE overload relays and photos. Click here for information on Z00 overload relays and photos. Click here for information on Z1 overload relays and photos. Click here for information on Z4 overload relays and photos. Click here for information on Z5 overload relays and photos. Click here for information on ZW7 overload relays and photos. Click here for information on EMT6 thermistor relays. Click here for information on ZEV electronic overloads. Moeller presents the new ZB overload relays. The DIL ER series of control relays and the DIL EM series of small contactors are a low-cost solution for light-duty requirements. The DIL EM-10 contactor comes with it's own series of ZE overload relays. Klockner Moeller offers a wide selection of push buttons & pilot lights in a wide variety of styles and sizes. All versions are oil-tight, and suitable for dirty locations. Click here for more information on M22 heavy-duty pushbuttons and photos. See our catalog page for Q18-RMQ16 miniature pushbuttons and photos. 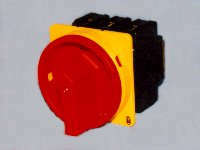 See our catalog page for Q25-RMQ16 miniature pushbuttons and photos. Klockner push button stations are available in various types, all custom made to your requirements. All are oil tight, and suitable for the roughest conditions. 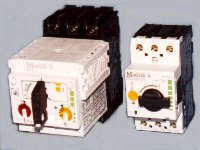 Moeller disconnect switches are available in all sizes and types. Shown here is the P1/P3 series which goes up to 100 amps. Safety first! Click here for more information on safety disconnect switches and photos. These manual motor starters provide excellent motor protection including a full circuit breaker and an adjustable motor overload. Optional contactors are available. Enclosed versions are available. PKZM0 motor protectors and SE00 contactors and photos. New: PKZM01 pushbutton operated and photos. PKZ2 motor protectors and S-PKZ2 contactors and photos. replacements for obsolete PKZM1 and photos. Moeller was the first manufacturer to comply with the new UL/CSA standard for self-protected combination motor starters per UL 508 / CSA 22.2 No. 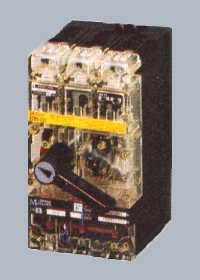 14 Type E.
These compact ( 8" x 2½" ) units provide complete motor protection including disconnect, short circuit trip, motor overload and contactor. Click here for information on self-protected motor starters and photos. klockner moeller has a full line of limit switches, oil tight and nearly indestructible. Various types are available, including different contact arrangements and various contact heads including rollers, levers, plungers, etc. Click here for more information on AT11,AT12 & AT21 limit switches and photos. Click here for more information on AT0 limit switches and photos. Click here for more information on AT4 limit switches and photos. The AT0 and AT4 limit switches are also configured as safety interlocks for control cabinet doors and machine safety covers. Versions are available that indicate door opening, as well as other versions which lock electrically. Moeller announces the new LS series of limit switches, available in plastic or metal construction. Also availare electronic versions with adjustable setpoints and sensor-type outputs.. This is the latest thing in mini-PLC's. A single EASY512 relay can replace an entire control panel of 16 control relays in one tiny (2 ¾" by 3 ½") inexpensive package. Programming can be done using the buttons on the front of the relay, or with optional windows software on your PC. The standard version includes 8 inputs and 4 relay outputs, and is available in AC and DC versions. Click here for our PLCs catalog and photos. Click here for our PLCs Programming Tutorial. Molded-Case Circuit Breakers are available for every application and size. Versions with non-adjustable trips are UL Listed Branch Circuit Breakers, and there are versions with adjustable thermal trips to be used as motor protectors with built-in overloads. Click here for more information on NZMH4 circuit breakers and photos. 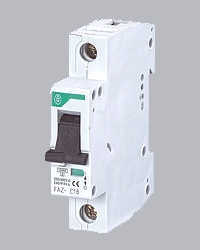 Click here for more information on NZM6 & N6 circuit breakers and photos. Click here for more information on NZM9 & N9 circuit breakers and photos. 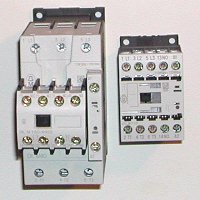 Click here for more information on NZM7 circuit breakers and photos. 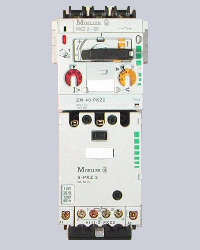 Click here for more information on NZM10 circuit breakers. The Felten & Guilleaume subsidiary of Moeller produces a complete line of miniature (3/4" wide) rail-mounted circuit breakers. They are especially suited as control voltage protectors. They are available in several different magnetic-trip calibrations, and come in 1-pole, 2-pole and 3-pole. Numerous optional accessories include neutral-pole, auxiliary contacts, undervoltage trips and shunt trips, etc. Click here for more information on mini-breakers and photos. See also the new FAZ Xpole version. Moeller produces high quality electronic timers, both in the new 7/8" wide format and also in a wider 1 3/4" format. They are available in On-Delay as well as Multi-Function versions which include on-delay, off-delay, blinker, pulsing, fleeting contact and various other types. Time ranges vary from 0.05 seconds up to 100 hours. Click here for more information on electronic timers and photos. 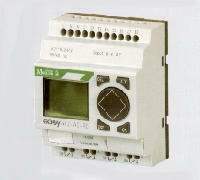 Moeller offers special relays for safety and for measuring & monitoring electricity. 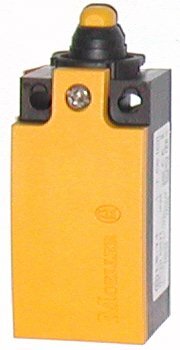 Click for ESR4 safety relays. Click for EMR4 monitoring relays. Moeller offers pressure switches for direct starting of 3-phase compressors. Click for MCS11 Pressure Switches and photos. 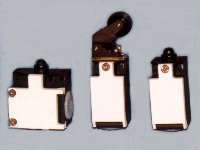 Most imported machinery includes DIN Standard fuses as shown here. Additional information on these fuses is shown in the siemens section of our site. 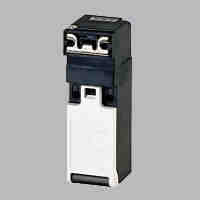 Click here for information on 5SB, 5SA, 5SD, 3NA fuses. Click here for information on 3NE, 3NC drive fuses.